PHP is one of the world's most popular programming languages for building dynamic data-driven Web applications, and IBM data serv­ers store a majority of the world's data -- combining these two technologies is a natural step for any Web developer. 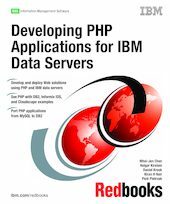 This IBM Redbooks publication provides lots of information for developers, including code samples for creating PHP applications with DB2, Informix Dynamic Server (IDS), and Cloudscape. We use the latest PHP data access extensions including: PHP Data Objects (PDO) and the native ibm_db2 extension for PHP. We describe the installation and configuration details for setting up the IBM data servers and Apache Web application server for PHP applications. We include Zend Core for IBM, Zend Studio installation, and configuration. In addition, we discuss the process of porting PHP applications from MySQL 5 to DB2 UDB V8.2.